This article is about the helicopter-like vehicle often piloted by Bowser Jr. For Bowser's personal airship, see Koopa Clown Car. The Junior Clown Car is a miniature version of Bowser's Koopa Clown Car commonly used by Bowser Jr. Like the original, it is a helicopter-like vehicle with an innocent clown face on the front, which has the ability to change its expression, but with a smaller smile. Its rim and propeller are colored the same shade of green as Bowser Jr.'s head. Compared to the Koopa Clown Car, the Junior Clown Car has been shown to be more versatile, especially in the Super Smash Bros. series, boasting more weapons and functions in its arsenal than the original including boxing glove-covered mechanical arms, wheels and thrusters, and built-in Grinders, drills and wrecking balls. The Junior Clown Car's facial expressions are slightly different from the original's, since it cannot shed tears when it's sad, yet it can frown when it is angry, a trait that the original lacks. In New Super Mario Bros. Wii, the Junior Clown Car is introduced as Bowser Jr.'s version of the Koopa Clown Car. Bowser Jr. uses this vehicle twice in battle, and for the third time, he ditches it for the original clown car. Mario, Luigi, Yellow Toad, and Blue Toad can also ride smaller copters exclusively in World 6- Airship. These smaller copters highly resemble a usual Clown Car, except it lacks a face and feature an M or L, or a yellow or blue mushroom logo on it depending on the player. Shaking the Wii Remote produces a move similar to that of a Spin Jump, and crashing into Bowser Jr. with this maneuver is required to shove him into the surrounding electricity. The Junior Clown Car returns in New Super Mario Bros. U and New Super Luigi U. Like with the Koopalings stylizing their Airships, Bowser Jr. has customized his Junior Clown Car with various enhancements, including boxing gloves. Similar to the Paper Mario version of the Koopa Clown Car and Junior Clown Car, Bowser Jr.'s car has its angry face on for the entire time. Bowser Jr. and the Junior Clown Car first appear in the first level of Soda Jungle (The Mighty Cannonship in New Super Mario Bros. U, and All Aboard! in New Super Luigi U). Like past encounters, it has a happy face on initially, although it briefly resorts to its angry face when firing Torpedo Teds. After he is defeated the first time, he uses the boxer variation in his second battle in the last level of Meringue Clouds (Boarding the Airship and Bowser Jr. Showdown, respectively), which also contains a payload of Bob-ombs. In the final level of both games, Bowser Jr. appears in the Junior Clown Car chasing after Mario and attacking by pounding the ground with the car. 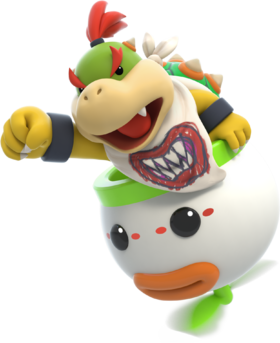 Bowser Jr. later uses his standard Junior Clown Car to fight Mario alongside Bowser. Unfortunately for him, Mario is able to pounce him and carjack him, as well as use the vessel to ram into his father's head. 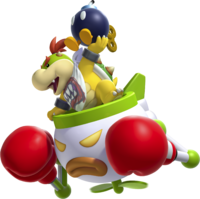 Bowser Jr. later uses it to escape when Bowser inadvertently destroys what was left of the Airship, with Bowser and the Koopalings holding on (the latter via the former's tail). The Junior Clown Car makes an appearance in Super Mario Maker and Super Mario Maker for Nintendo 3DS, replacing the Koopa Clown Car when using the New Super Mario Bros. U style. Aside from its minor atheistic change, it functions exactly like the Koopa Clown Car in other game styles. If the clown car is shaken, it will turn into the Fire Koopa Clown Car. Additionally, when using Bowser Jr.'s Mystery Mushroom costume, he will appear in the Junior Clown Car. In Mario Party 9, Bowser Jr. uses his Clown Car primarily as a mode of transformation and uses it (or variations of it) during his minigames. Additionally, in the Bumper Sparks minigame, players use vehicles very similar to the Junior Clown Car's playable counterparts to bump into Bowser Jr. to try to knock him into the electric barrier, just like New Super Mario Bros. Wii. In Bowser Jr. Breakdown, the Junior Clown Car merges with a larger, claw-armed model for the boss fight. Bowser and Bowser Jr. also ride their respective vehicles in the ending. The Junior Clown Car makes an appearance in Mario Party 10, functioning primarily as Bowser Jr.'s mode of transportation. When doing an event that causes players to lose mini-stars (in Mario Party mode) or hearts (in Bowser Party mode), it gains its boxing glove attachments from New Super Mario Bros. U. In Mario Party: Star Rush, the Junior Clown Car is used by Bowser Jr. in Toad Scramble mode and Bowser Jr.'s Pound for Pound. In Mario Party: The Top 100, Bowser Jr. riding on the Junior Clown Car replaces the Koopa Kids in the minigame The Final Battle!. As in the original minigame, players have to dodge his attacks while completing a moving piece puzzle with his face drawn onto the pieces. The Junior Clown Car appears in Paper Mario: Sticker Star. It's mostly used as his mode of transportation, but Bowser Jr. uses it during all of his battles. In Bowser Jr.'s Flotilla, it can shoot fireballs or Spiked Balls for attacks. The Clown Car also uses its protection shield from previous titles to block attacks. A Junior Clown Car makes a cameo appearance in Emerald Circus of Paper Mario: Color Splash. The concept art shows that it was originally going to be a Koopa Clown Car. Bowser Jr. and the Junior Clown Car both appear as the final boss of the Battle Ring in Mario & Luigi: Dream Team. While it is not his vehicle's debut, it is officially named the Junior Clown Car for the first time. It guards him from attacks and at one part in the battle becomes its own enemy target separate from Bowser Jr. When Mario or Luigi tries to use the Jump attack on the Junior Clown Car while Bowser Jr. is outside the Clown Car, they will not attack it, but instead will get in it. They taunt Bowser Jr., and rustle through the Clown Car to find items to throw at him. The Prima guide erroneously refers to the Clown Car Bowser, Private Goomp and Sergeant Guy ride on in the ending as the Junior Clown Car. Both the normal version and paper versions of the Junior Clown Car appear in Mario & Luigi: Paper Jam. They are initially used by the Bowser Jrs. to flee Mount Brrr with the Kameks and Princesses. Later, the paper version is used by Paper Bowser Jr. at Bowser's Castle to recapture the Princesses after they escape. Both versions are used during the boss battle against the duo. Much like in Mario & Luigi: Dream Team, Bros. Attacks that do not hit from above are nullified by the cars. In Mario & Luigi: Superstar Saga + Bowser's Minions, the Junior Clown Car appears as Bowser Jr.'s main mode of transportation when he is unlocked in the Minion Quest: The Search for Bowser mode of the game. The Junior Clown Car makes an appearance in Mario & Luigi: Bowser's Inside Story + Bowser Jr.'s Journey where Bowser Jr. uses it for the "Snacktime" and "Volleybomb" commands. In both cases he pulls out a remote control to summon the clown car and, in the case of the former, control it. During the story, Bowser Jr. modifies the unmarked clown car Iggy was using into a Junior Clown Car. He uses this clown car when changed to flying-type in a similar manner to Minion Quest. The Junior Clown Car is used by Bowser Jr. for the entirety of Puzzle & Dragons: Super Mario Bros. Edition. For his special move "Junior Smash", Bowser Jr. rams the party with the Junior Clown Car. Bowser Jr. and the Koopalings make their Super Smash Bros. series debut as unlockable newcomers in Super Smash Bros. for Nintendo 3DS and starting newcomers in Super Smash Bros. for Wii U, and reappear in Super Smash Bros. Ultimate, piloting the Junior Clown Car. Each Koopaling drives a specific-colored Junior Clown Car that have yellow lights for eyes instead of black proper eyes like Bowser Jr.'s version, though since the Koopalings are alternate costumes for Bowser Jr., they all fight identically, using various weapons the clown car is equipped with. In fact, aside from Bowser Jr.'s up special and Final Smash, the Junior Clown Car itself does most of the attacking. In addition, the player takes less damage if the clown car is hit rather than Bowser Jr. or the Koopalings. In Palutena's guidance conversations about the Koopalings, their Clown Cars are called a mass-produced type of Koopa Clown Car, with Pit concluding that Bowser Jr. must have "preferential treatment." In Super Smash Bros. Ultimate, Bowser Jr.'s down tilt attack now allows the Junior Clown Car to consume food with its tongue, which can be useful for healing damage from a distance. Bowser's Jr.'s standard special attack, Clown Cannon, can have multiple cannonballs on the screen as opposed to one. In Mario Tennis: Ultra Smash, Bowser Jr. is a playable character who is riding in the Junior Clown Car. The Clown Car actually uses the mechanical arms with boxing gloves from past games to hold the racket. The Clown Car plays a similar role in Mario Tennis Aces. It is shown to include rocket thrusters and a kart mode, much like Super Smash Bros, in its trick shots. It also has a smaller version of the Mecha Hand from New Super Mario Bros. U during Bowser Jr.'s trick shot. While it does not make a physical appearance in Mario Sports Superstars, gear modeled after the Junior Clown Car (called Bowser Jr. Clown in-game) is obtainable. Additionally, Bowser Jr.'s Baseball and Soccer emblems are patterned after the Junior Clown Car's color scheme. The Junior Clown Car appears in Mario + Rabbids Kingdom Battle, where Bowser Jr. and Spawny use it as transportation. Later, in the Lava Pits, Bowser Jr. uses it as the cockpit of his Mecha Jr. machine. Unlike most depictions of the car, it does not change expression at all in this game. Spanish (NOE) Minihelikoopa From mini (mini) and Helikoopa. For this subject's image gallery, see Gallery:Junior Clown Car. The coloring of Iggy Koopa's Clown Car in the Super Smash Bros. series and Koopa Clown in Mario Kart 8 Deluxe is very similar to the Junior Clown Car. However, while the latter vehicle is based on the Koopa Clown Car and changes colors for the Koopalings only, the Junior Clown Car in the former game is colored a darker shade of green to distinguish it from Iggy's. This page was last edited on April 5, 2019, at 21:13.